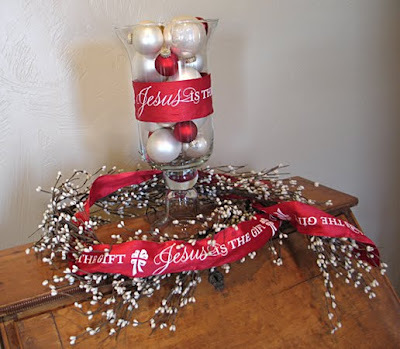 See my previous post for more Christmas evergreen ideas. Visit A Soft Place to Land for DIY ideas. Visit Today's Creative Blog for Get Your Craft On. So pretty! I love simple beauty. I sent you an email with my physical address. Can't wait to see the plaque! 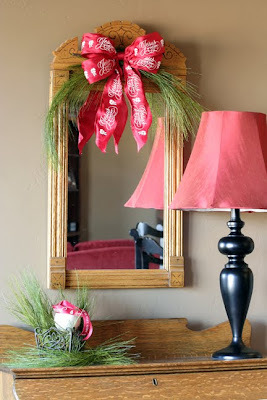 Love the simple , yet graceful decorating you have done ! Love the green and red touches, it's beautiful! Everything looks so pretty! Where did you find that ribbon, I love it! The ribbon is from DaySpring. I added the info and link to the post! Thanks! I love greenery too - it adds such impact - and if you've got it around you it's free. Wow, it all looks SO pretty! Hi, I'm stopping by from SITS! I just wanted to share a bit of comment l♥ve. I hope the rest of your week is absolutely amazing! Very inspiring! 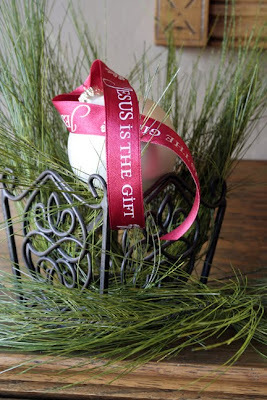 I love all of the greenery and the ribbon is a great idea!